Antonio Guaineri. De Artetica et De Caculosa Passione, in Latin. 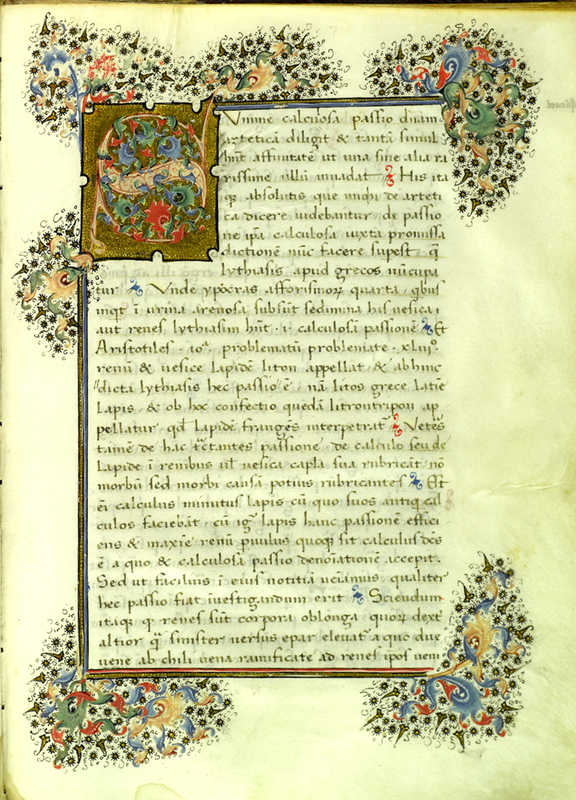 15th-century manuscript on vellum, written in Italy. Bound in original wooden boards covered with stamped brown leather. 46 illuminated initials. Although ascribed to Pope Nicholas V (1397-1455), the medical tracts contained in this manuscript are the work of the 15th-century Italian Professor of Medicine Antonio Guaineri, who lectured at the University of Pavia in 1412-13, and again in 1448. In the intervening years, he may have spent some time in Savoy and Liguria, as his tracts identify him with these localities. He is perhaps most remembered for his work on the plague, De Peste, which he finished before 1440, the date of the earliest extant manuscript. Widely disseminated medical tracts like this one in Lehigh's collection were both a cause and a result of the new scientific consciousness that touched many in Italy and would influence the work of Galileo.